Members of the Forum of Bereaved Families voted to protest the delay in the implementation of the law to offset terrorist funds from the Palestinian Authority budget, which came into force on January 1, 2019. At a briefing for journalists, the families noted that 35 days after the start of the new year, nothing happened. Not only were funds not set aside for terrorism, but the report that the Defense Ministry was required to present to the cabinet has not yet been presented. In light of this, money continues to flow to the PA without hindrance, even when it boasts, as it did just a few days ago, of the sums of money it pays the terrorists. The families said that at the beginning of January, the Defense Ministry said they were still collecting the data, and that this was the reaction at the end of January. "For seven months, the ministry could not have produced the report as required by law? Every month that goes by is another NIS 110 million that goes unchecked to terrorists and terror, "the family members say." We came here today to say to the Israeli government - no more! Honor the law passed by the Knesset by a majority of 87 Knesset members and immediately implement the law of setoff. " Shai Maimon, a terror victim and one of the initiators of the law, said at the press conference: "The Israeli government is delaying the application of the law for no reason ... Maybe we should remind them that in the meantime terrorists shot and killed a baby and injure his parents, killed soldiers at a hitchhiking location. There were six more attempted attacks, they kill and injure us, and we continue to pay the price, literally." 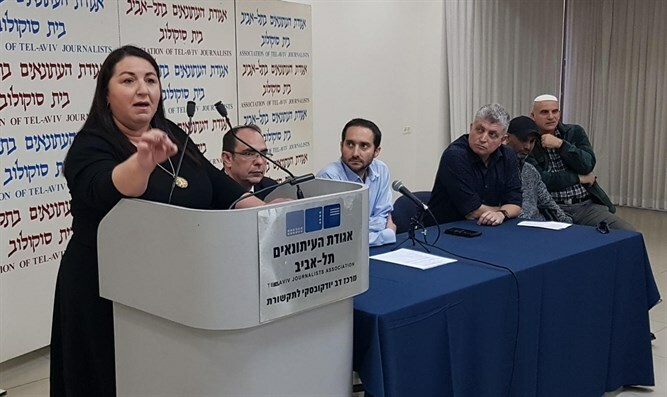 Deborah Gonen, the mother of the late Danny Gonen, noted, "There is no more absurd situation that the Knesset is enacting a law, and the executive authority, which it so agreed upon, does not act to enforce the law. The law of offsetting was legislated for the sake of a holy cause and is the success of the lives of innocent civilians. On the lack of enforcement of the law, it seems that the executive branch, headed by the prime minister and the defense minister, is giving a hand and tailwind to the continued encouragement of terrorism in the State of Israel." Boaz Kokia, the father of the late Ron Kokia, also attacked "the concept held by civilian or security bodies in Israel, that the welfare of the Palestinian Authority must be maintained and then they will stop the incitement and terrorism is a fiction. The opposite is correct. If we punish the PA financially, it will have to stop paying terrorism and diverting funds for civilian purposes as it should be. I call upon the members of the current Knesset, the ministers and the Prime Minister to begin immediately to offset the funds according to the law." The Defense Ministry is expected to release its report on the PA's payments to terrorists and the Cabinet to approve the offsetting of funds to the PA within the next two weeks.